The Barbet originated in France and is one of the oldest breeds of dog. It belongs to the family of water dogs that flush birds (particularly waterfowl) and then retrieve them. They work on both land and water, adept at retrieving in even frigid water. In its earliest days, before the use of sporting guns, the Barbet would also retrieve fallen arrows that could not be reached by humans. The name Barbet comes from the French word barbe, which means ‘beard’. One of the oldest breeds of dog, the Barbet is known to have existed in France since the Middle Ages. Their ancestry is unknown, although most believe they stem from corded herding stock. Dogs of this type were first mentioned in 1387 in a book written by Gascon Count. They were a favorite hunting companion of many French monarchs, especially Henri IV and Louis the XV. 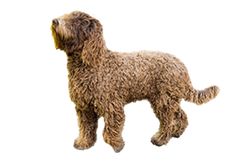 It is often stated that the Barbet is the ancestor to the Poodle (or the other way around) but the two were still considered the same dog up to the late 19th century. It was not until dog shows became popular that they separated and continued to develop into two distinct breeds. By the mid 20th century the Barbet almost died out, first due to the popularity of the Poodle and then after both World Wars. After WWII there were only two known breeders in France, and the Barbet was not known elsewhere. Careful breeding restored the bloodline, most notably by Dr. Vincenti and his daughter Madame Petre. Although the Barbet’s future was secured they still remain a fairly rare breed. However, it is now recognized by the American Kennel Club in its Miscellaneous Class, so its popularity will likely only increase. Is the Barbet Right for You?